Siege Prelude Average 0.00/5 - out of 0 total votes. Collects Dark Avengers #1, Dark Reign: The Cabal, Thor #600, Dark Reign: The List - Avengers, New Avengers Annual #3, Dark Reign: The Goblin Legacy and Marvel Spotlight (1971) #30. 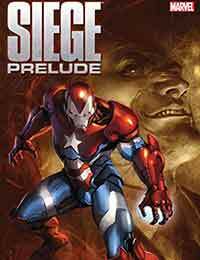 One collection packed with stories leading into Marvel's major event SIEGE! Remember when you were first introduced to the Cabal, the gathering of the most sinister members of the Marvel Universe, and you said to yourself: Well, that's going to blow up in everyone's face! Well, you were right!! Norman Osborn faces off with Doctor Doom and his mysterious threat to Doom is revealed.